The target landscape selected as the focus of COMDEKS activities in the Kyrgyzstan is a coastal strip around Lake Issyk-Kul, located in the Issyk-Kul Province. Lake Issyk-Kul is the biggest lake in Kyrgyzstan: it is one of the 25 largest lakes in the world, and the seventh deepest. The landscape area selected is a coastal strip, limited on one side by the surf line and on the other side by the highway. 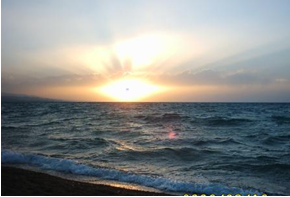 The area surrounding Lake Issyk-Kul, renowned for its unique beauty and historic relevance, is currently facing pressure from a large influx of tourists. To mitigate this, protection of this pristine, but strained coastal ecosystem, is increasingly important. The area surrounding Lake Issyk-Kul, renowned for its inimitable and unique beauty, is also rich in natural resources and biodiversity. However, over the last fifty years, the ecosystem has been deteriorating significantly One of the major problems facing the region is the destruction of the natural ecosystems in the coastal zones, attributable in part to tree felling activities and inappropriate uprooting and burning of local sea-buckthorn thickets related to sanatory and agricultural development. Experts estimate that the degradation of some coastal ecosystems has reached critical values, and that without urgent action, the effects of environmental degradation on the landscape will become irreversible. An additional strain on the target landscape comes from poorly regulated fish farming., as predatory fish species make their way from nurse ponds into the lake, threatening the natural fish population. The Issyk-Kul Province is an area inhabited by over 400,000 people, mostly employed in the tourism and agriculture sectors. Livestock production, mostly of sheep and goats, is a critical aspect of the local economy, and a portion of the population also engages in fishing activities. Although there has been increasing focus on agricultural production, mainly of vegetables and fruit, there is heavy dependence on food imports from surrounding Kazahstan, Russia, and China. As a result, the development of local markets and promotion of local products for export are critical in enhancing food security. One outcome of heavy dependence on livestock production is overgrazing, which has led to the replacement of forage grasses with poisonous plants, as well as threats to human health. Furthermore, the growing agricultural sector relies heavily on the use of chemical fertilizers and pesticides, which then can seep into the lake. While on average lower than the national level, poverty rates in certain districts of the Issyk-Kul province are still quite high. For example, in the area of Jety-Oguz, approximately 75% of the population lives in poverty. As a result, there is a high dependence on the local ecosystems as a source of basic resources, leading to excessive use and subsequent land degradation, soil erosion, water and soil pollution, and deforestation. A baseline assessment was carried out to understand the current state of the landscape and to identify potential interventions towards developing sustainable livelihood activities in the context of sound biodiversity management. A group of exports of biodiversity, ecosystem productivity, sustainable agriculture, sociology, irrigation, and renewable energy visited over 50 communities surrounding Lake Issyk-Kul to involve the local community in the assessment. Over 20 presentations and small workshops were conducted, and each community delegated a representative to then participate. Over 280 community members participated in the baseline assessment workshop, which took place in Karakol in October 2013. Next, 18 community delegates, representing men and women equally, participated in the scoring of the resilience indicators. Based on the results of the Workshop and the expert studies and recommendations proposed, a strategy was developed with the long term objective to enhance the resilience of the socio-ecological production landscape. 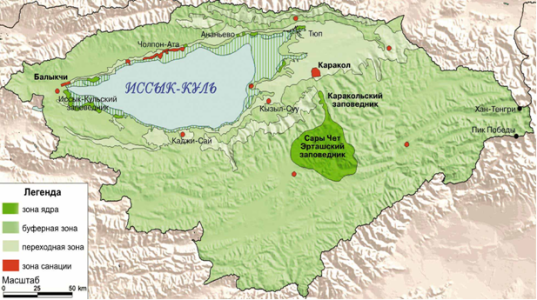 The restoration of degraded landscapes and coastal ecosystems of the Issyk-Kul Lake area, as well as the continued provision of ecosystem services. Implementation of sustainable agricultural practices across the landscape. Strengthening of institutional capacity at the landscape level in order revitalize the goal of integrating conservation and production in management of the target landscape. The COMDEKS project seeks to bring about community development, learning, and knowledge sharing by making small grants available to community organizations to help them maintain more resilient socio-ecological production landscapes. The types of community projects that will be supported by the COMDEKS initiative in Kyrgyzstan include the restoration of degraded land in the coastal zone of the lake, revegetation in the drylands, restoration of wetlands surrounding the lake, and the creation of nurseries of the wild endemic plant species. Additionally, other types of projects might include the promotion of innovative practices of pond farming to mitigate the strain on Lake Issyk-Kul’s naturally occurring fish species, as well as the cultivation of medicinal herbs, and the use of renewable energy sources to reduce the impact of the felling of local natural forests. To learn more, please download the COMDEKS Country Programme Landscape Strategy for Kyrgyzstan here.